The amount of choice of secondary school you will enjoy is somewhat limited. It depends where you live and the nature of the schools in your local area. If many of the schools are over-subscribed in your area, then it is likely that your child will be allocated to the school dictated by your postcode. Almost all schools use proximity within admission policies and sometimes siblings being in the school can influence decisions. There are means to appeal and so there is every point in investigating the local schools to help you state your preference on the form when it arrives. Although you will receive a lot of material from local schools, there is often little relationship between promotional materials and the reality. Therefore, it is important to visit – both formally and informally – and look for the right things. You will be invited to local schools for open evenings. The open evenings are official events run by the school to promote themselves. Therefore, what you see is the school at its best. This does not mean it is a waste of time. It is good to speak to teachers and hear the values of the head teacher. You can also try to look below the surface of the promotion at what the school really offers. First, look at the students. 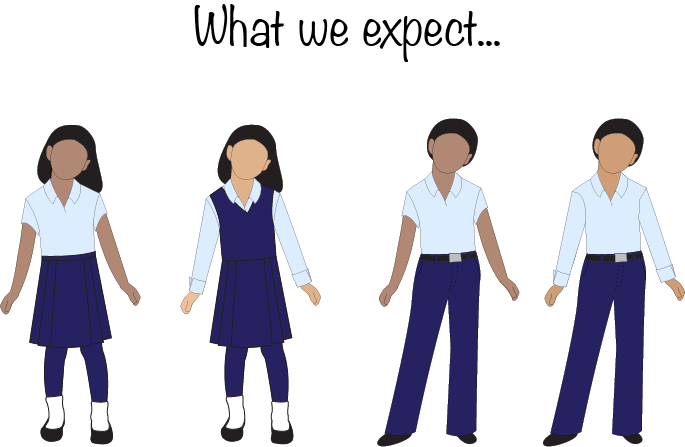 They will be dressed to the highest of the school’s expectations. If the children look a little ragged or the skirts are a little short, then you need to imagine that this will be much worse on a day to day basis. Is this important? It might be. The common perception within schools is that paying attention to the small details and small rebellions prevents the bigger ones from happening. If the school attends to the rules of school uniform it signals a belief in boundaries and high standards. If the students want to wear the school uniform smartly it can also show their pride in the institution. However, this is the equivalent of judging a book by its cover and it may be an unfair assessment. This means that it should only be an initial assessment, a starting point. Judging the maintenance of the facilities may appear like another superficial judgement and, in some ways, it is. A school may have a limited budget and they may choose to spend it on other items, such as equipment for learning. Yet, a welcoming environment, where the staff take pride in the building, signals something of how cared for students might feel. The level of commitment to this environment is best judged by going as far as possible from the parents’ entrance. Then, look in the student toilets at this distant end of the building. If these toilets are graffiti free, freshly painted, clearly cleaned regularly and with appropriate materials for student use – then this school genuinely cares about its environment – and by extension the children within. This does not mean a flashy media centre or copious computer suites – it is the small, fundamental details that show an attitude to the comfort of the students. At open evenings the teachers will have been given time to put up displays and make the classrooms look appealing. The school will shine as a learning environment – with work celebrated, keywords and advice for success everywhere. Therefore, judging whether this is the norm or not is difficult. However, look to see if the tables are organised in rows or in groups – this will tell you of the preferred learning approach of the teachers within the school. Look for lone tables and chairs in classrooms, outside of rooms or in corridors – this will signal an area of isolation for children who misbehave. Check out where the teacher’s desk is placed. Is it front and centre, suggesting the teacher delivers lesson sat down? Is it off to the side and stacked high with books – is this the sign of a dynamic teacher who works hard for your child? Have a glance in children’s exercise books, which should be available for view and check how many times it has been marked, the quality of the teachers’ comments and the intellectual level the child is expected to work at. At all times you should ask: does this school demand high expectations and follow up? - how are the students dressed – do they still look smart? - are there any staff out at the front of school supervising the safety of students as they leave the building? - are students saying goodbye to staff and lingering to have last minute conversations? - are there any signs of roughness between students? - are there any students leaving looking upset? - how quickly do the children tumble out and do they observe road safety? - how neat and tidy does the school look from the road? Is there a lot of litter? - is there any sign of extra activities about to start out on the sports field or children still in classrooms? - how full is the staff car park? Have teachers rushed away from the building too? The headline figures are the statistics that the school releases to the press and emphasise to the public. For instance, your local school may call itself the most improved school in the county or may suggest they have the highest grades in the area for core subjects. This sounds impressive but may not tell the whole story or help you understand how well your child will do in that school. The percentage Grade 4 and above in English and Maths is a statistic that will be published. This is a national benchmark for young people to enter further education study, and so should be of importance to those attending the school. This is currently the equivalent of what was known as a Grade C. It is difficult to say what are excellent figures here, as a lot is ruled by the context of the school. If the school admits a lot of students with learning disabilities and difficulties, then this figure will be lower than average. If the school attracts students from an upper, middle class catchment that will have naturally high aspirations – then this figure will be much higher than average. You would hope that more than 7 out of every 10 students would achieve this benchmark, if your child has a hope of being amongst those who do. However, this is not a hard and fast rule. A much better set of statistics to view is the Progress 8 data. This data will tell you how much influence the school had on the learning of the child. Every child is expected to improve by three levels in 8 different subjects. If they do achieve this level of progress, then they are included in the percentage for Progress 8. So, if 85% of students in a school achieve Progress 8 then the school has done a great job – as a massive proportion of students made this challenging level of progress in the school. This percentage figure is a judge of learning in the school and means that students at all levels will need to be pushed – and not just students sat at Grade 3 who teachers wish to move to Grade 4. If you view the school’s complete set of results you will see the data broken down by groups. You will find out how well gifted students did, students with additional needs, girls and boys, children with English as a second language, children who get free school meals, and children in care. This will highlight to you the strengths and weaknesses of the school – though it is less obvious what is a good result here without knowing a lot more background information about the school. It is worth knowing that any major gap in performance would be judged badly by OfSted – so if girls are doing significantly better than boys, for instance, the school would struggle to achieve an outstanding grade when inspected. When judging a secondary school your child should be uppermost in your mind. Therefore, if your child has a specific need then it is important that you meet with the person responsible for helping them at school. If, for instance, your child has been told he/she is dyslexic, then you should meet with the SENCO to ask about provision and additional support. If your child is particularly anxious then you should meet with the Head of Year, to seek reassurance that they have procedures in place for easy transition to the new school. If, when you meet these people, you are reassured and feel confident in their ability – then this should go a long way towards influencing your preferences. It is the personnel within a school who directly interact with your child who will have most influence on their contentment and success. A school should be assessed by its ability to develop the whole child. Academics and results are important, of course, but so is the chance for your child to develop the talents and passions they possess. There needs to be adequate provision in the school for any child who walks through the door to find something that inspires them. - what sports teams do you have, and do they play other schools? - is there an opportunity to take a foreign trip in their time at the school? - are there clubs for those who like to play games like chess, Warcraft, etc? - what activities are put on in the library? - what arts can my child experience other than those in the classroom? - what trips do you run? - my child is shy, are there clubs that can help with this? - my child has a talent for music/ languages/ maths/ a.n.other – how will you develop this? Your child’s future secondary school should care about more than examination results. They are responsible for your child’s wellbeing for about 40 hours a week for 40 weeks a year. You want the whole child to be seen and encouraged to belong and be the best they can. Therefore, it is important to look for signs that the school has a firm handle on the safety and the personal growth of students. Obviously, you should expect the teachers to know your child’s name. This is a given. What is more revealing about the ethos of a school is if the senior teachers can call a student by name. When you are speaking to the head teacher or the deputy head teacher do they speak to the children using their names, and do they ask questions that show they know them as individuals? This is a sign that the school sees your child for who they are, and they care. Asking about the approach to discipline in the school is crucial. It is likely that you will be asked to sign a parent school agreement, where you accept the boundaries set by the school. It is important to take this document seriously, as it will give an idea of the approach the school takes to rules. It is likely that the school will have a graduated approach to consequences. There should be a clear list of expectations and then a clear set of consequences should these not be adhered to. It is possible when visiting the school for open evening to ask about the discipline policy. It must also be published on the school website, along with all other school policies. Bullying is likely going to be the biggest concern for your Year 6 student. They are going from being the biggest fish in a garden pond, to be a minnow in an ocean. Therefore, it is important to find out information about bullying at the school and the school approach to bullying should it happen. First, it is important to ask if bullying happens at the school. The honest answer will always be yes. Secondary schools often have more than a thousand teenagers in a small space and teenagers don’t always get relationships right. If a school says they do not have a bullying issue it may indicate that they do not have a structured approach to student relationship issues. It is then important to ask how they deal with bullying. It may be that the school has a no blame approach, or a policy of restorative justice or bullying may form part of their consequence guidance. When selecting your child’s secondary school knowing his or her opinion should be a huge part of the decision-making process. It is possible this will be directed by where their friends are going. Whether this is important or not depends on the quality of the schools in your area. However, the voice of the young person is going to influence how well the transition between primary and secondary school goes. Therefore, if there is a difference of opinion between what you know to be best and what your child hopes will happen, then you need to talk them through how to make the right choice.